For more information about each agenda item, please visit the online agenda at http://www.boarddocs.com/ak/akcrsd/Board.nsf. Please note, as part of the agenda, the Board of Education invites public comment on agenda and non-agenda items. Please join us for the work session and/or regular meeting. As we get ready to celebrate the New Year we are giving you an opportunity to help schedule the next two school years. In keeping with past practice, the Board of Education is providing an extended opportunity for public comment on draft 2014-2015 and 2015-2016 school calendars. 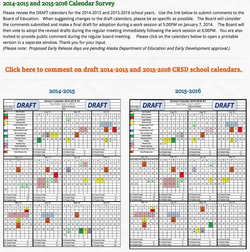 By visiting our website at http://www.crsd.us (or click here) you will find a link to the calendar surveys. The Board of Education will consider all calendar input submitted at a work session on January 7, 2014. Adoption of the 2014-2015 and 2015-2016 CRSD school calendars will be on the agenda for the regular monthly board meeting which will begin at 6:00PM on January 7, 2014. Public comment on agenda and non-agenda items are invited at all regular board meetings. Opening up the comments section for blog posts is both exciting and intimidating. It will be exciting to interact with readers on various education policy and news items. It is a bit intimidating due to the time requirements that may be involved and the tact required to maintain guidelines for an online conversation. Obviously I don’t want to create more stress in my job than already exists :). Online conversations and debates are useful, but can only go so far in creating consensus and progress. Links to other internet sites are not endorsed by the CRSD. This blog endeavors to inform, educate and facilitate the exchange of ideas. 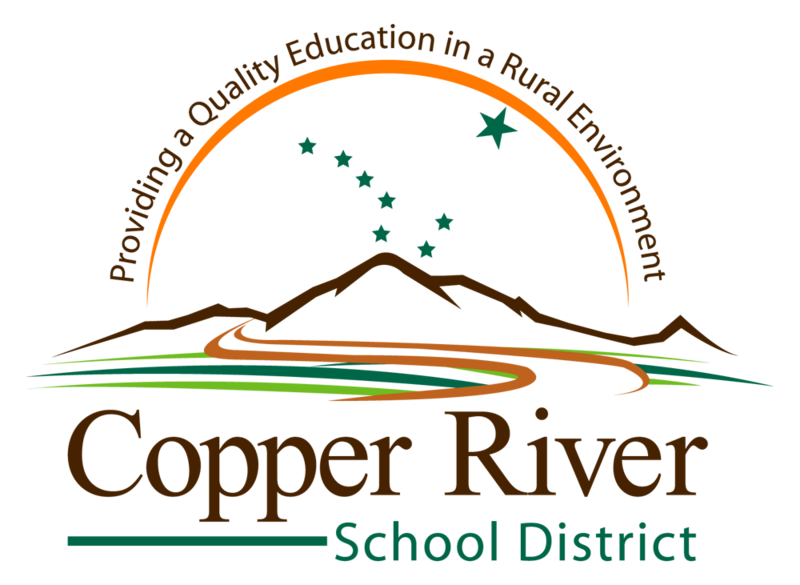 The views, opinions and information contained in posts and comments do not represent formal action by the Copper River School District Board of Education. Their opinions and values are best expressed by the action taken at formal board meetings each month. You can access the agenda and minutes of Board Meetings by clicking here. The public is invited to provide comments on agenda and non-agenda items at the beginning of each board meeting. I enjoy a robust conversation, so I plan to encourage, not limit, the conversation as much as possible. Much like letters to the editor and the opinion pages in national newspapers, online communication is not an effective conflict resolution strategy (hint hint KTUU and GCI). Ultimately, I hope the online dialogue sets an example for our students of a deliberate conversation by people with varying opinions. If we don’t set a positive example of the civic process, the evening news shows will. If you have any feedback, ideas, or suggestions regarding guidelines for a school-district sponsored online conversation please share them in the comments section below. For the past year we have worked hard to upgrade our district’s website. Much has been accomplished but we have hopes of doing much more as part of our effort to connect our schools, families and community. Our blogs have been a work in progress. Our vision for the blogs has evolved with use. We have observed that school blogs are appreciated as a source of school news and announcements. Each school blog is linked to the district’s Facebook and Twitter pages. “The Current” was originally created to be a place for district-wide news and announcements. We have struggled to give it its own identity while not overshadowing the individual school blogs. Our plan going forward is to continue supporting “The Current” as a place for district-wide announcements and news. Additionally, we will also use it to continue passing along announcements from other community organizations that serve students and youth. Another need that has become apparent is a blog that facilitates an easily accessible forum for policy news, explanations, and requests for comment. As we’ve monitored the use and feedback from our school blogs, we have decided to experiment with a separate superintendent’s blog. “Superintendent Snippets” will primarily focus on policy, education news, highlights and district-wide administrative issues. I imagine I’ll also periodically share pictures, stories and other observations from my perspective as I travel about the district. There’s a story to be told every time I visit one our classrooms – especially kindergarten. We have dedicated teachers and wonderful students, the perfect recipe for a good story. At times other district-wide staff and board members may blog on this site. Teachers and support staff may also be asked to share their perspectives on various policy and education news items. Finding opinions won’t be hard. Finding people with the time and desire to write and the courage to publish is anot her story. All of the above is accomplished by amateurs. None of us are social media experts. All of us have full-time responsibilities. Some of us take a long time to write. Our other daily responsibilities don’t become more manageable because we blog. We do hope that you’ll be better informed, more encouraged to give us feedback, and feel genuinely connected to our school district. We’ll try to post regularly. Be patience with us. There are times when deadlines and quick turn-arounds required by the state and federal government will occupy more time than you think. We’ll try to get ahead, develop routines and keep interacting with the blog, including your comments. Please use the comments section below to offer your own ideas and suggestions for future blog posts.